Chamendran is sure to melt your heart with his charm, humour and dashing good looks. This young doctor has started realising his dreams since being chosen as part of the Top 10, but it's not all been fun and games. 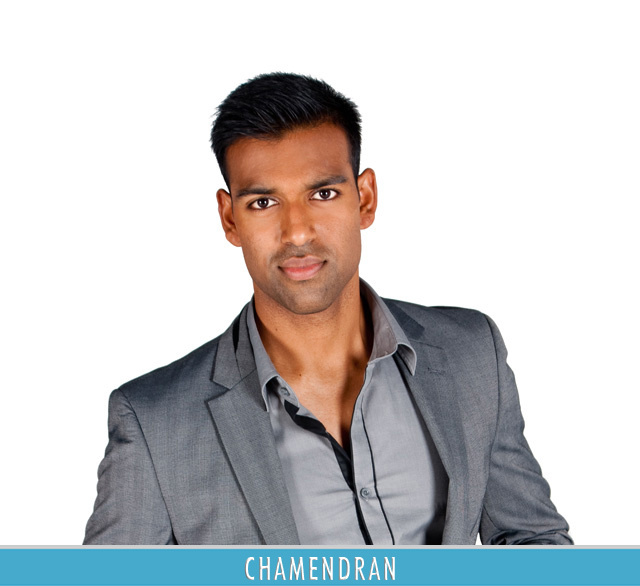 As someone who is always trying to be the best person he can be and help his fellow man, Chamendran assists sick children after hours at the Red Cross children's hospital and has provided first aid for major sporting events such as the Super 12 and the Cape Argus Cycle Tour. Originally from Durban, he couldn't resist the charm of the Cape and started work as a doctor for the South African Navy this year. In his spare time he takes French classes, to add to his impressive array of languages that include English, Afrikaans, isiZulu, Portuguese and Mandarin. Chamendran is in the competition for the long haul, armed with his wit, humour and debonair looks. Does this modern-day gentleman have what it takes to take it to the finish? "Initially I had a mixed bag of feelings when we were told we were going to interview the Isidingo stars. It started out as exciting and then the nerves kicked in. It was going to be 'little old me' interviewing 'big old them' - but in the end I embraced the challenge fully." "It was definitely difficult to decide which information would be more pertinant and also which questions to ask, because I didn't want to ask him something that he gets asked all the time." "There was a little trick the crew played on me and which Vusi was in on. During the interview, he was not receptive at all; they had told him to stonewall me. I didn't quite understand, because I was chatting to him before the interview and he was a really nice guy and then the interview started and it was like Dr Jekyll and Mr Hyde. But in the end I managed to salvage the interview and change my strategy on the spot. I'll take the lesson with me, that YOU don't dictate the terms in an interview, your interviewee does." "The fashion show was as adrenaline-infused as any adventure sport out there. It required as much if not more concentration than other links as chaos ensued around us. I loved the reaction from the crowd which definitely spurred us on to perform!" "Definitely rocking the itsy bitsy twentieth weenie cozzi! But I tried to pull it off with confidence." "I learnt that the rigors of the fashion industry are far more danzig than originally expected which required a certain amount of finesse to pull off." "Short answer? Death defying! We were really put through our paces during the challenge having to relate to camera while being physically tested. The best part of the challenge was getting to experience a sport that I had always wished to delve into albeit dismally. The toughest part of the challenge was remembering to break away from being totally engrossed in an extreme sport in order to relate the experience to the audience."